We've had regular visits over the last 12 months or so from Paul at QeyTek - we ply him with tea the ocassional biscuit and he shows us new things from DTS and ELC. 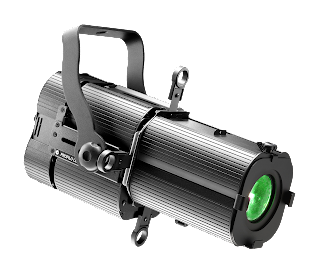 He arrived this week having been to see another distributor with demo units of the new Scena and Profilo LED luminaires from DTS. They're intended for small drama spaces such as studios or even school stages and with quiet running fans won't be especially obstrusive over the noise of an audience. To precis the blurb from the DTS brochure "SCENA LED 80 is a compact, lightweight, DMX-controlled LED projector equipped with an high-power Full Color (RGBW) LED featuring 4 LED channels (Red / Green / Blue / White) giving approximately 3660 Total Lumens. The Scena features a 112 mm Fresnel lens, and a long excursion 14°- 77° linear zoom with dimming curves similar to those of halogen lamps." The unit is physcially about the same size as a Quartet fresnel and against daylight in our shop was giving a very respectable output with a nice even beam. 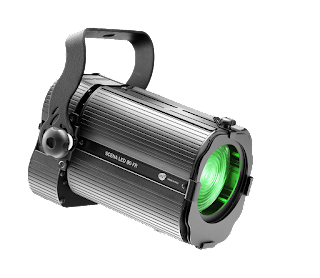 Again PROFILO LED 80 FC is a compact, lightweight, DMX-controlled LED shaper equipped with an high-power Full Color (RGBW) LED featuring 4 LED channels (Red / Green / Blue / White) giving 3660 Total Lumens). It features a 18°- 36° linear zoom with high-efficiency optical system, and an internal rotating system with four removable shutters, to give high-precision shaping of light beams. If you're intrigued and would like to know more about these two units then please give our sales desk a call.